I was recently asked to review the Moody Publishers Book Imagine That by Manuel Luz. I enjoyed it immensely and recommend it very highly! Crossroads' Creative Arts Small Group began reading it last night. It is very exciting to have a resource of this quality! Thanks Manuel! We all drew, painted, or sang at the top of our lungs and participated in all kinds of artistic endeavors when we were young. We continued creating until someone told us we were not good enough. This was just one of many thought provoking truths discussed in the book. Manuel masterfully explores all the many reasons the Christian artist is so needed and so valued by God. His conclusions give encouragement for each of us to continue following our God calling toward wholeness. Manuel talks in detail about Bezalel being the first person mentioned in the Bible to be filled with the Holy Spirit. This brilliant, talented artist was chosen to design the Ark of the Covenant, trusted with all the details. This unique distinction does not fall on a leader or a prophet or a king, but upon an artist. Manuel goes on to say Worship is described as “one of our most basic responsibilities”. He says that rather than worship being an event that happens on Sunday, it is actually an eternal interaction between the Triune God and His creation. It does not begin with something we do, but with something God has already done. My day was richly blessed when I attended a workshop at the Saddleback Worship Conferenc e not even knowing Manuel Luz would be there. Now I will be taking every artist that God has placed under my leadership through this amazing book to be affected for eternity! I encourage you to do the same, you will not be sorry! 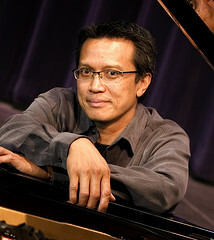 Manuel is the Creative Arts Pastor at Oak Hills Church in Folsom, CA. He is a working musician, with almost fifty albums to his credit. He holds a BS in aeronautical engineering and an MBA in management.